Her current audience is mostly over 40’s. Mothers with children, family and friends. Yet her music could touch the hearts of a 1000 youngsters. After initially being signed to Warner Bros’ records in 1977, a slot on Saturday night live and a handful of live shows, she was dubbed “The Duchess of Coolville” by Time Magazine. Mentored by legendary Jazz Producer Tommi Li Puma, her style is subtle. As is her focus on ambient Jazz progressions. She’s multitalented, playing drums, guitar and piano all during the same set, with horn, harmonica and harp skills also on her long list of achievements. Her rotation is vast, but her trips down under are few. She herself made note that she’s lucky to end up on this side of the equator once every 15 years. So… I consider myself lucky to have graced her presence; even if, for just a fleeting moment. A sit down audience sip champagne quietly in the foyer and wait. Ushered onto the main floor, seating is reserved, upper balcony full, and empty chairs are scarce to be seen. Her followers are diverse in nature yet all encompass a common cause shared with the Duchess herself; A love for music, creativity and self expression. A cocky punter at the bar was caught saying… “This looks like the same crew we’ll get for Slash..” and laughs. Sarcasm is the lowest form of wit my friend. There’s no support act, no prelude and no set list. This is a show from a seasoned musician, who does it her way, in her time. Sporadic mixes of songs are played when, and how she wants. Rickie throttles the few who are yet to be seated as she begins to play. Her first words of the night being “Let’s just do some acoustic stuff while those who DIDN’T, get here on time find their seats…” She seems nervous in a way… making it apparent throughout the night that she DOESN’T, like her aura being interrupted. She’s settled in, removed her shoes, requested the lighting be softened during her piano solo, and tells the enthusiastic audience to save their shout outs till AFTER she’s done. Exorbitantly poetic by nature, her lyrical themes are vast, singing of hope and demise, from the stars above to the pits of hell, rage, racism, innocence and fear. She creates ambient sounds that vibrate around the room simply by plucking a guitar string. A slight push off, a little tremolo, and the sound is no longer one note, it’s a feeling, a memory, a piece of your soul. The use of maracas, a triangle, and chimes accentuate the flow. She’s a queen of progressive building, an architect of song structure. By her sixth song, the acoustic is replaced by the electric and the ambience intensifies. Although it’s by no means a “heavy” set.. the drummer wipes the sweat from his face with a towel. It’s forever heated under the spotlight…. He uses brushes in place of sticks to augment the Jazz flavours… softening the crash of the cymbals to create a softer, wider sound; a five string bass, ever presently providing depth to Rickie’s melodies. Singing “A monk with a hard on in a lavender robe…”, her voice doesn’t hold its pitch as well as you’d assume. Although seasoned and learned in her arts, her vocal refinement isn’t something she’s renowned for. She’s somewhat raspy, doesn’t hold her high notes too well, and at times, seems to miss them completely. I’m unsure if this is due to her nerves, or a slight setback from her day’s hitch hiking the US during the hippie movement. It all adds to her uniqueness. But If Rickie’s ability to emotionally entrap her audience was the point of this show, the point has been proven. There are tears streaming across the face of the lady next to me during “Lucky Guy” (1981’s Pirates)…. a track written about Rickie’s experiences with fellow songwriter, and early life love interest Tom Waits. When she plays “Old enough” (2009’s Balm in Gilead)… the gathering click their fingers and sway in their chairs. Rickie announces that her young daughter loves dance music…”The worst kind”! But in the attempt to keep up with the times, Rickie has incorporated some basic dub beats via keyboard, and parked them right behind a jazzy piano solo. I went to the gig with no expectation or preconception of what was to be but I leave the building in wonder. 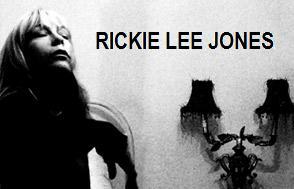 Ms Rickie Lee Jones, her strength of character, diversity, music and life story have most definitely inspired me. So… I’m off to check out the back catalogue…….